Today, Oakland’s hardworking teachers and students begin a well-deserved winter break. When they return in 2015, negotiations on a new teacher contract will resume between the Oakland Unified School District and the Oakland Education Association (the union representing over 2,500 teachers). Last week, we learned that Oakland teachers are among the lowest paid in the nation. Our communities know that Oakland teachers need a big raise and this contract gives us an opportunity to pay our teachers a salary that allows them to put down roots in Oakland. Currently one in five teachers leaves Oakland schools each year and this turnover hurts our students and holds schools back. The district has put on the table a raise of up to 13 percent, including more time for teachers to collaborate. This is a big step in the right direction — teachers deserve this increase now. Click here to read the latest proposals from OUSD and the OEA. The teacher contract goes far beyond setting compensation. With this contract, our district and our teachers have the opportunity to set strong policies that enable teachers and students to succeed. The contract sets conditions that influence student learning such as school schedules, class sizes, teacher preparation, collaboration, evaluation and professional development. The district is proposing a key change in the way that teachers are assigned to schools. Currently, seniority is given preference over other factors. The proposed change would give school communities a voice in hiring teachers for our schools. Committees of teachers, other staff, and parents would recommend candidates to principals. This will enable schools to build stronger teams around a common vision, and help transform some of our lowest-performing schools. School communities know their students and schools best and are best positioned to make key decisions that affect them. Giving schools increased decision-making power through the input of teachers, parents, students, and administrators is the right change for Oakland kids. 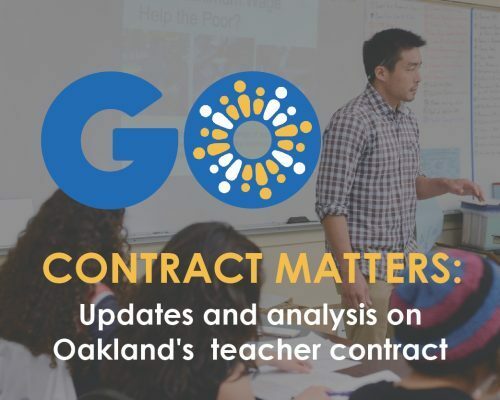 The contract impacts everyone in Oakland and is critical to the success of the district’s new strategic plan. Let’s take this opportunity to make great changes for our teachers and our students. As we learn more about proposals from the district and the union in the coming months, we will do our best to keep you informed. Wishing a safe and happy holiday to all Oakland teachers and families!